Manchester celebrated the festival of St Patrick one day early today with a long procession from the Irish Centre in Cheetham Hill to Albert Square. 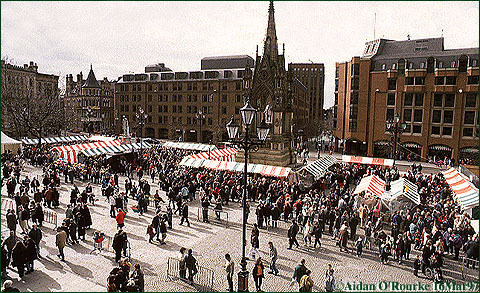 A market was held in front of the Town Hall, which threw its doors open to huge numbers of people, many wearing shamrocks and Irish tricolours. Irish food and drink, including some quite authentic-tasting Guinness, were served at very reasonable prices. Today was the culmination of over a week of special events and attractions, but tomorrow may prove to be equally if not more festive, with many workers taking a half day off in preparation for St Patrick's night. This has undoubtedly been one of the biggest and most successful events in City Centre Manchester. The happy and peaceful atmosphere all round shows that any bad feeling due to last year's bomb has been well and truly put to rest. On Friday the national "Red Nose Day" charity event took place, with many fund-raising events and stunts being held all over the city. This week's good news is marred by a fatal shooting which took place on the West Parade housing estate in Sale on Monday night. Off-licence owner Ian Marshall, 48, was shot dead during a struggle with raiders. At 7 pm yesterday police arrested a 19-year-old in Hulme in connection with the murder. Last week's arson attack in Salford was followed by another, this time on a boat moored at Salford Quays. Ironically, the floating theatre had just been refurbished with lottery money. The owners hope to have the theatre running again soon. And on Friday, Salford announced it would put its own site on the Word Wide Web in order to promote the city. £18,000 has been set aside for the project. As protesters continue digging tunnels near the far end of the Airport, Roads minister John Watts caused outrage by saying that Swampy, alias Daniel Hooper, most celebrated eco-warrior of the moment, ought to be "buried in concrete". The mighty Granada TV was humbled by the purchaser of a Coronation Street videotape, who took the company to court because one of the episodes on tape, according to the label not shown on TV, was screened three months later. Granada was ordered to pay him the price of the videocassette, £11.99, but more claims may follow from another 700,000 fans who bought the video. Spring weather made another appearance on Tuesday, with sunny, hazy skies and extremely mild temperatures, in fact, more like summer than summer itself. The evening temperature is currently 12/54 degrees.